Armed police officers swooped on a prisoner’s house to rescue his ‘very hungry’ pet gerbil after he refused to let the RSPCA gain access to the pet. Officers from Derbyshire police’s armed response unit were called to help force entry into the home in Allestree on Saturday night. The prisoner had been in jail for a week but was refusing to let the RSPCA in to get the gerbil so they could prevent the animal from dying or suffering. The charity told the police who sent uniformed officers and also the armed response unit to help. A post on the Derby city centre safer neighbourhood police page said: ‘Tonight our officers have been on the sharp edge of policing as always. ‘Our friends at the RSPCA informed us that an individual who was currently in prison, and had been for nearly a week now, had a gerbil at his home address. 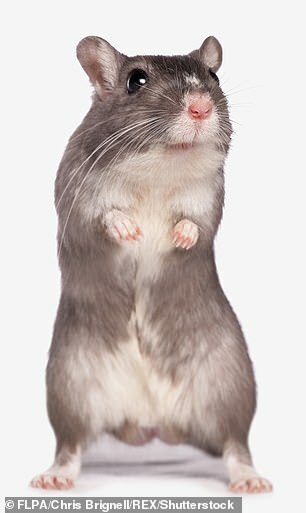 ‘Sadly the individual was refusing to give access to their address so that the RSPCA Officers could prevent the gerbil from dying or suffering unnecessarily. ‘Our officers forced entry to the address with some help from the armed response unit and found the gerbil who was thankfully still alive but very hungry. ‘The gerbil was taken to a nearby vet where it will be looked after by the RSPCA. 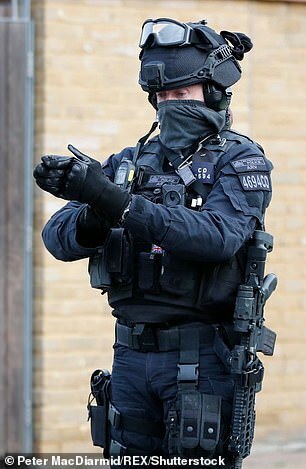 Officers from the armed response unit had also tweeted about the incident – but they appear to have since been deleted. Derbyshire’s police and crime commissioner Hardyal Dhindsa has previously said more armed officers in the county are needed to make the force more resilient to modern day terror threats. He said he would lobby for more cash because he feared the Derbyshire force will not be able to react to an attack in the county as quickly as officers did in the in London and Manchester atrocities. A spokesman for Derbyshire police said: ‘Following information from the RSPCA, officers from Derby city safer neighbourhood team visited a property on Abbey Hill Road, Allestree, to prevent unnecessary suffering to an animal inside. ‘Derbyshire police’s Armed Response Unit also attended to assist officers in gaining quick access to the property. ‘The animal, a gerbil, was taken to a nearby vet at the instruction of the RSPCA. ‘Responses to calls from partner agencies, such as the RSPCA, are one of the many elements of community policing. ‘Attendance at this incident had no impact on operational policing, due to Armed Response Vehicles being deployed across the county. ‘Armed officers are routinely called on to provide support in gaining access to properties where there is a cause for concern. ‘Had there been a need for them to be deployed elsewhere, officers would have been able to be mobilised quickly.